Since our last Update in July, the UAI core team has been busy on a number of fronts. You will find below a summary of the activities we have organised or participated in. As you will see, our incubation phase is now over. We have had our Founding General Assembly and UAI is now registered as an association. This allows us to move ahead with the implementation of the Strategic Plan adopted in June for the UAI consolidation phase (July 2018-December 2019). We have formalised an International Executive Committee (IEC) that will coordinate the activities and growth of UAI. A number of meetings and mini-launches are planned for the coming months to spread the word about UAI. As noted below, we have already been invited to participate in key events and more are in the offing. We will also work on op-eds and our digital platform: the website is available as from today to coincide with the release of this Update as well as our social media accounts (follow us Facebook and Twitter). Crucially, we will take the message and develop partnerships with civil society organisations and citizen groups beyond the usual suspects in the Global North. Please help to disseminate the ‘Call to Action’. Use it to engage with colleagues at work but also share it with family and friends, with your local authorities or places of worship. Use it to challenge parliamentarians and politicians to ensure respect for fundamental humanitarian norms. And send us feedback. We need your ideas and your help to take the message far and wide. Do write in with your suggestions! Let us know if you wish to participate or expand upon the UAI activities mentioned below. We envision UAI as a network of networks and partnerships of individuals and groups that share indignation and outrage about the international community’s inability to address deepening crises. From Afghanistan to Yemen, from the Mediterranean to Myanmar, but also in neglected crises like Cameroon, Nagaland or southern Thailand, civilians continue to suffer. If states or international organisations are unable or unwilling to solve these crises, advocacy and popular mobilisation is, at least partly, the answer. Producing credible and verified information on these crises and mobilising around them is the niche that UAI aims to occupy. So far we have been working on a shoestring and practically all our work has been done on a voluntary basis. As we are now ‘legal’, we can start to fundraise in earnest so that we can set up a small secretariat that will coordinate our research and civil society mobilisation activities. We are setting up a bank account to receive membership fees and private donations. We are inviting those who want to ‘join’ UAI as Active members to contribute a legal annual membership fee fixed at the equivalent of 5 euros so that membership is accessible to members in any country. We encourage of course contributions of larger amounts from members or supporters who are willing to express their support for UAI in this way. At this stage, we will not be looking for government funds in order to stress that UAI is and continues to be perceived as totally independent. So please send us ideas or contacts for potential sources of private funds bearing in mind that we would like to have the widest possible international funding base. 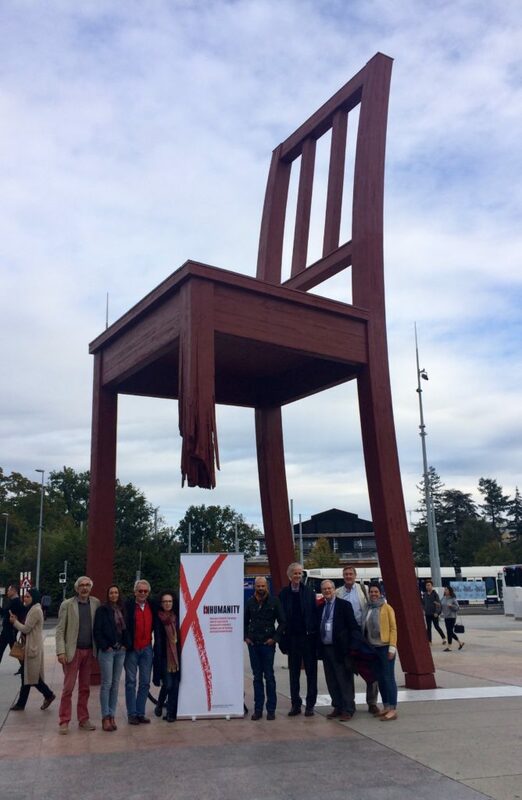 Picture taken at Geneva on October the 2nd 2018, day of the constitutive general assembly of the NGO United Against Inhumanity. Appear on the picture from left to right: Jean-Baptiste Richardier, Nathalie Herlemont, Antonio Donini, Norah Niland, Tammam Aloudat, Martin Barber, Mark Bowden, Nicolas Borsinger, Audrey Sala. As foreseen in the last update the UAI Constitutive General Assembly (GA) was held on October 2nd in Geneva. The GA is now formed of 28 members of 14 nationalities, participating in their individual capacity (ten attended in Geneva, nine were connected by video-call, three participated by proxy and six were excused). Even though the meeting was organised in Geneva, French law was chosen to create the UAI legal base for three main reasons: it is a very convenient law regarding freedom of association; in comparison to Swiss law, it offers favoured fiscal advantages to non-profit organisations; and there is no legal obligation to name a President, a Treasurer or a General Secretary, a possibility that reflects well and preserves the collective non-hierarchical nature of UAI. The statutes that have been prepared over the summer were unanimously adopted. In accordance with the statutes the members of the Expanded Core Group were designated as the International Executive Committee (IEC) for a temporary period. An elected IEC will be set up at the next General Assembly. Please note that members of the IEC participate in UAI in their personal capacity (more information is available below). Jean-Baptiste Richardier was designated to register the organisation at the Préfecture du Rhône in France as well as to open a bank account to enable donations to UAI. Supporters of UAI are individuals or civil society organisations that register their endorsement of UAI’s Call to Action. They pay no membership fee and may not vote at UAI’s General Assembly but will receive regular updates. Donations by both Members and Supporters are encouraged, however, and UAI will issue receipts for all contributions. An Advisory Board will be formed, open to representatives of national/regional chapters and groups, partners and supporting entities. By-laws will be drafted soon to define and regulate the relationship between the IEC, the Advisory board, local initiatives and local chapters or networks. A brief presentation of the IEC members is available here. The International Executive Committee has the responsibility to ensure that the administration and management of UAI is effective and transparent. The International Executive Committee will meet as frequently as necessary, and at least twice a year, and will issue regular updates of its activities. In almost all consultations leading up to the founding of UAI, participants emphasised the importance of a simple 2-page document that would explain why UAI is needed what it is, who the people supporting it are, what it is calling for and how it intends to achieve its goals. The Core Group has spent many hours considering how best to respond to these requests. Ideas were put forward for a Declaration or a Manifesto, but eventually it was agreed that a “Call to Action” would best encapsulate what we hope people around the world will wish to endorse and sign on to. The Call to Action was approved by UAI’s International Executive Committee (IEC) on 2 October 2018 and was endorsed unanimously by the Founding General Assembly. Supporters of UAI are warmly encouraged to register their endorsement of the Call to Action, to disseminate the Call to Action as widely as possible and use it in their advocacy efforts. In addition to the Call to Action, the IEC feels that it is important to offer a summary of the Call, which also answers other basic questions about UAI, including what we see as its added value and how UAI is structured and organised. The result is the Frequently Asked Questions (FAQs) document, available here. Antonio Donini and Khaled Mansour attended the 5th bi-annual Conference of the International Humanitarian Studies Association in The Hague, The Netherlands, from 27 to 29 August 2018. They both spoke at a panel on Tackling Inhumanity. Antonio spoke on the Banality of Inhumanity and Humanitarian Responsibility’ while Khaled spoke on‚ Rebelling Victims: Civilians in Middle East Conflicts’. Khaled gave one of the opening keynote speeches at Unity Church (his 25 minute speech is at 1:49:30 till 2:14:30) on the need for mobilisation and civil society intervention to resist the on-going erosion of IHL and the increasing war atrocities. Also Antonio and Khaled each published a blog based on their contributions and ideas raised at the conference; these can be read here and here. CONCERN Worldwide held an international 50th anniversary conference on “Resurgence of Humanity, Breaking the Cycle of Conflict, Hunger and Human Suffering” that paid tribute to CONCERN’s origins in the Biafra war. Ireland’s President Michael D. Higgins opened the Conference with a vigorous presentation on contemporary inhumanity, the legacies of injustice, the return of hateful political ideologies, the failures of multilateralism and the hope inherent in active civil society groups throughout the world. Participants and speakers from Ireland and elsewhere included academics, diplomats, civil society activists including Aline Berabose CONCERN’s Youth Ambassador and survivor of the Rwanda genocide, senior UN and African Union staff as well as former Presidents Mary Robinson and Bill Clinton. Norah Niland who attended the conference had an opportunity to discuss UAI and distribute the Call to Action to various participants including Presidents Higgins and Robinson. Under the theme ‘No More Excuses – Advocating for Human Dignity in Times of Crisis’ more than 20 panels and sessions were presented, including a presentation of UAI by Antonio Donini. For more information click here. Tammam Aloudat and Antonio Donini chaired panels, and Ulrike von Pilar gave the closing remarks on the occasion of the 20th anniversary of the congress. Among many side meetings Antonio and Ulrike met with Ursula Müller, Assistant Secretary General for Humanitarian Affairs and Deputy Emergency Relief Coordinator in the Office for the Coordination of Humanitarian Affairs (OCHA) who was very enthusiastic and supportive of UAI. Martin Barber, Mark Bowden and Jean-Baptiste Richardier were invited to take part in this two-day conference, which brought together academics in the business sector with business leaders. Although the link to UAI was not obvious, UAI’s Call to Action was included in the conference documentation at the initiative of the organisers and UAI was further introduced to the conference in a Keynote Address delivered by Jean-Baptiste Richardier who highlighted the opportunities for collaboration between businesses and NGOs in fragile states, while emphasizing the importance of ethical and context-specific interventions. In conflict situations, businesses might even help to convince warring parties to exercise restraint and to consider the opportunities for future post-conflict economic activity. Subsequently, LBS offered to consider supporting UAI through the assignment of student consultancies on specific issues related to the UAI agenda. The UK chapter will maintain the contact. A technical meeting, co-organised by UAI and the Department of Anthropology, Edinburgh University, was held at the University, which also helped fund the event. A background paper prepared by Norah Niland with various attachments helped frame the discussion that was held under the Chatham House rule. UAI members Martin Barber, Antonio Donini, Norah Niland and Ulrike von Pilar attended the Edinburgh meeting. The core purpose of the meeting was to explore the feasibility of developing an Independent Humanitarian Watch (IHW) and/or (In)Humanity Index in light of the experience of others involved in documenting the impact of war on civilians or engaged in efforts to counter deterrence policies designed to impede asylum flows. The overall objective was to inform UAI decision-making in relation to the potential development of an IHW and/or Index. Participants included a geographic and multi-disciplinary mix of 18 academics and practitioners who contributed to a rich and rewarding discussion on investigating, documenting, analysing and reporting issues as well as advocacy related to warfare and asylum concerns. The meeting reviewed a broad range of initiatives dedicated to reducing the impact of war on civilians. This included casualty recording as well as the Safe Schools programme, index development in relation to refugees, and earlier efforts to develop an “IHL Watch” in 2012. Participants discussed concerns and lessons learned while also highlighting the advances that have been made in developing consensus on standards, methodologies and tools although harmonization is still a work-in-progress on some matters. Are UAI’s basic assumptions on contemporary inhumanity correct? What is the level of public disillusionment and potential for change? What is UAI’s model for change and stance on the relationship between data, analysis, and advocacy? What lessons can be learned from prior initiatives to advance respect for IHL and other humanitarian norms? Data analysis and advocacy should help the public connect the dots – understand the relationship, for example, between arms sales to Saudi Arabia and the human cost of the on-going war in Yemen. The significance and implications of the Global War on Terror (GWOT) in the post 9/11 world order needs to be better understood including in particular in terms of related brutality and inhumanity. International Humanitarian Law (IHL) as a legal framework is inadequately applied and not easily understood among the general public. 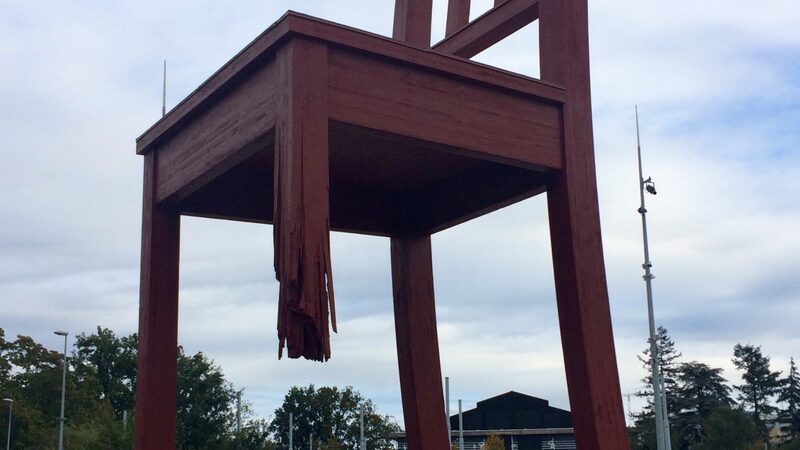 In reality, “it is easier to get away with committing a war crime than with stealing a car in Geneva (or any other city)”; the absence of particular tools such as an IHW or Index that allow regular citizens to engage in processes that challenge patterns of inhumanity is a long-standing problem that needs to be addressed. Common Article 1 of the Geneva Conventions that obliges all State Parties “to respect and ensure respect for the Conventions in all circumstances” is little known and widely ignored, illustrated by the absence of a formal peer review or other mechanism geared to securing compliance of warring parties with basic humanitarian norms. In light of the discussions and insights gained from the Edinburgh meeting UAI’s International Executive Committee (IEC) will review suggestions and proposals concerning potential future collaboration on the IHW or Index propositions made at the meeting and subsequently. UAI is keen to develop partnerships including but not only with Global South networks and will take this into account when determining next steps. Proposals for next steps include a potential meeting organised in collaboration with Boston University and InterAction in 2019 to review specific issues and to facilitate forward movement. Colleagues in universities and think-tanks in Manchester, Dundee, Edinburgh, New Delhi and Berlin have made various proposals to examine in greater depth data collection exercises and methodological tools for documenting civilian harm with the potential help of students doing case studies on practical experiences or analysis of theoretical issues. Proposals have also been made in relation to mapping in order to generate a picture of existing data collection exercises, their precise purpose and end use. UAI is scheduled to review and make decisions, in the near future, on suggestions for future collaboration geared to the potential development of an IHW and/or Index. The first draft of a paper commissioned by UAI ‘Acts of Resistance to EU Deterrence Measures and the Criminalisation of Solidarity‘, that involves analysing measures taken to criminalise seeking asylum in search of safety as well as humanitarian rescue operations was received. After a peer review and input from a small number of stakeholders the report will facilitate UAI’s engagement in the criminalisation context of forced migration. The paper provides a brief overview of recent policy developments in Europe regarding asylum and mapping some of the existing initiatives challenging the criminalisation of humanitarian action. By summarising some findings of recent studies on the mobilisation of political support for people on the move the report further explores different strategies used to influence political practices in the legal, political and media sphere. UAI is invited to participate in the next GRUPC, an informal meeting of French NGO leaders. It will be an opportunity to measure the interest of formalising a UAI French Chapter/Network. On that occasion, Ulrike von Pilar and Jean-Baptiste Richardier will invite financial support for the UAI consolidation phase and the establishment of the foreseen small UAI secretariat. A “mini agora” with the participation of Khaled Mansour, member of the IEC, and Jean-Marie Guéhenno former UN Under-Secretary-General for Peacekeeping Operations. Pauline Chetcuti, Head of Humanitarian Advocacy and Policy at Action contre la Faim will act as moderator on behalf of Humanitarian Alternatives. During the Forum UAI will also have a half hour “Pitch slot” where Antonio Donini and Norah Niland will present UAI. The event is organised by the Human Rights Institute at Deusto University in Bilbao with the collaboration of the Network of Universities in Humanitarian Action (NOHA) and UAI. The workshop has will provide an initial overview of global changes and current crisis trends and their implications for the protection of at risk individuals and communities as well as key challenges and dilemmas faced in the protection of humanitarian action. On the afternoon of the first day there will be a launch of UAI organised jointly with Deusto and the Guernica/Gernika Foundation. For more info click here. Ulrike von Pilar will speak as part of the introductory panel on ‘Humanitarian Intervention’ and also present UAI. UAI will not accept core funding from governments, although such funding may be considered for technical meetings in relation with the pursuance of its objectives. Private fundraising will therefore be of paramount importance to cover the cost of the secretariat and IEC activities. Beyond the six organisations that have provided support and advise and co-funded some travel cost during the incubation phase, it is foreseen to approach numerous organisations around the world with a reasonably modest request for a financial contribution. This approach will facilitate decisions to contribute and will reflect the diverse support by private entities. Toward that end, a budget with projects identified for 2018-2019 is being finalised and will be widely circulated. Another document presenting an overall plan and strategy for 2018-2020 is also under preparation to seek the support of major private foundations. Finally, a fundraising strategy geared toward individual donors will be established.